Granular Cell Tumor (GCT) is mostly a benign soft-tissue tumor with a Schwann cell phenotype that can arise in any site in the body [1Jaeger MJ, Green WR, Miller NR, Harris GJ. Granular cell tumor of the orbit and ocular adnexae. Surv Ophthalmol 1987; 31(6): 417-23. [http://dx.doi.org/10.1016/0039-6257(87)90033-6] [PMID: 30 39674] ]. The most common sites are arm, chest wall, and tongue [2Evans M, Chang E, Yu DL, Rao NA. Granular cell tumour: A rare caruncle lesion. Br J Ophthalmol 2006; 90(2): 246-7. [http://dx.doi.org/10.1136/bjo.2005.083790] [PMID: 16424 546] ]. GCT was described by Abrikossoff in 1926 as a tumor of the tongue with granular cells derived from striated muscle [3Abrikosov AA. Über Myome ausgehend von der quergestreiften willkürlichen Muskulatur. Virchows Arch 1926; 260: 215-33.]. This tumor was initially called granular cell myoblastoma or myoblastic myoma due to the location. However, this terminology is now considered to be controversial due to the histogenesis of the tumor [3Abrikosov AA. Über Myome ausgehend von der quergestreiften willkürlichen Muskulatur. Virchows Arch 1926; 260: 215-33.]. The occurrence of GCT in the orbit is very rare, and to date, only a few cases have been reported in the literature in English. GCT of the orbit presents as a slow-growing, solitary, well-demarcated unilateral lesion. Common clinical manifestations are swelling and pain, alone or in combination [1Jaeger MJ, Green WR, Miller NR, Harris GJ. Granular cell tumor of the orbit and ocular adnexae. Surv Ophthalmol 1987; 31(6): 417-23. [http://dx.doi.org/10.1016/0039-6257(87)90033-6] [PMID: 30 39674] ]. The condition is most common in women between the fourth and the sixth decades of life [4Ribeiro SF, Chahud F, Cruz AA. Oculomotor disturbances due to granular cell tumor. Ophthal Plast Reconstr Surg 2012; 28(1): e23-7. [http://dx.doi.org/10.1097/IOP.0b013e3182141c54] [PMID: 214647 81] ]. The presenting symptoms are diplopia, proptosis, and ocular dysmotility [4Ribeiro SF, Chahud F, Cruz AA. Oculomotor disturbances due to granular cell tumor. Ophthal Plast Reconstr Surg 2012; 28(1): e23-7. [http://dx.doi.org/10.1097/IOP.0b013e3182141c54] [PMID: 214647 81] ]. GCT should be considered in the differential diagnosis of orbital mass, especially when the extraocular muscles are affected [1Jaeger MJ, Green WR, Miller NR, Harris GJ. Granular cell tumor of the orbit and ocular adnexae. Surv Ophthalmol 1987; 31(6): 417-23. [http://dx.doi.org/10.1016/0039-6257(87)90033-6] [PMID: 30 39674] , 4Ribeiro SF, Chahud F, Cruz AA. Oculomotor disturbances due to granular cell tumor. Ophthal Plast Reconstr Surg 2012; 28(1): e23-7. [http://dx.doi.org/10.1097/IOP.0b013e3182141c54] [PMID: 214647 81] , 5Callejo SA, Kronish JW, Decker SJ, Cohen GR, Rosa RH Jr. Malignant granular cell tumor metastatic to the orbit. Ophthalmology 2000; 107(3): 550-4. [http://dx.doi.org/10.1016/S0161-6420(99)00135-9] [PMID: 107118 94] ]. 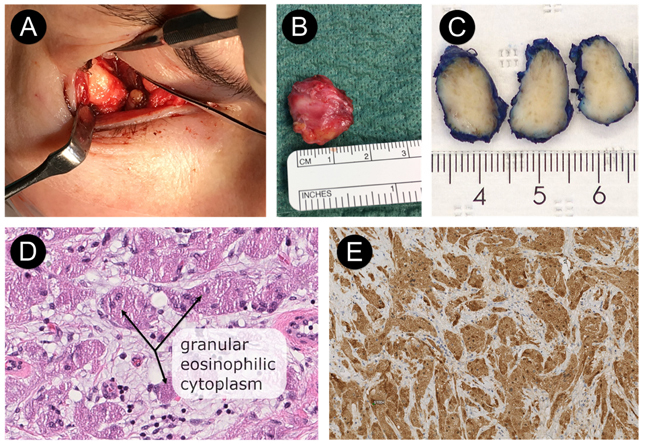 Involvement of ocular muscles and proptosis has been reported in 84.6% of orbital GCT cases [6Salour H, Tavakoli M, Karimi S, Rezaei Kanavi M, Faghihi M. Granular cell tumor of the orbit. J Ophthalmic Vis Res 2013; 8(4): 376-9. [PMID: 24653826] ]. Several imaging modalities have been used in patients with GCT of the orbit, including Computed Tomography scan(CT-scan) and Magnetic Resonance Imaging (MRI) [7Morimura T, Hayashi H, Kohchi N, Ozaki I, Tani E. MR appearance of intraorbital granular cell tumor: A case report. Am J Neuroradiol 1991; 12(4): 714-6. [PMID: 1882750] , 8Ghassibi MP, Ulloa-Padilla JP, Dubovy SR. Neural tumors of the orbit: What Is New? Asia Pac J Ophthalmol (Phila) 2017; 6(3): 273-82. [http://dx.doi.org/10.22608/APO.2017157] [PMID: 28558180] ]. Radiological examinations reveal information such as tumor size, extent of the tumor, and metastatic spread [9Silva M, Zambrini EI, Chiari G, et al. Pre-surgical assessment of mandibular bone invasion from oral cancer: Comparison between different imaging techniques and relevance of radiologist expertise. Radiol Med (Torino) 2016; 121(9): 704-10. [http://dx.doi.org/10.1007/s11547-016-0654-1] [PMID: 2726 2579] ]. Positron Emission Tomography and Magnetic Resonance Imaging (PET/ MRI) are more accurate than CT for the description of tumor involvement and soft tissue invasion [10Huang SH, Chien CY, Lin WC, et al. A comparative study of fused FDG PET/MRI, PET/CT, MRI, and CT imaging for assessing surrounding tissue invasion of advanced buccal squamous cell carcinoma. Clin Nucl Med 2011; 36(7): 518-25. [http://dx.doi.org/10.1097/RLU.0b013e318217566f] [PMID: 216370 51] ]. However, microscopic analysis of the tumor is regarded as the gold standard for distinguishing between malignant tumor and benign tumor [11Masamatti SS, Gosavi AV. 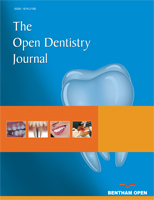 Histopathological study of malignant oral tumous: A five-year study. Int J Sci Stud 2016; 4: 30-4.]. Although GCTs are mostly benign tumors, Malignant Granular Cell Tumors (MGCTs) comprise approximately 1-3% of all granular cell tumors [5Callejo SA, Kronish JW, Decker SJ, Cohen GR, Rosa RH Jr. Malignant granular cell tumor metastatic to the orbit. Ophthalmology 2000; 107(3): 550-4. [http://dx.doi.org/10.1016/S0161-6420(99)00135-9] [PMID: 107118 94] ]. This type has an aggressive growth with a high rate of recurrence [5Callejo SA, Kronish JW, Decker SJ, Cohen GR, Rosa RH Jr. Malignant granular cell tumor metastatic to the orbit. Ophthalmology 2000; 107(3): 550-4. [http://dx.doi.org/10.1016/S0161-6420(99)00135-9] [PMID: 107118 94] ]. The histological differentiation of MGCTs from benign GCTs is crucial for treatment outcome. The most characteristic histological criteria for MGCT are mitotic activity, necrosis, increase in nuclear/cytoplasmic ratio, and pleomorphism [12Fanburg-Smith JC, Meis-Kindblom JM, Fante R, Kindblom LG. Malignant granular cell tumor of soft tissue: Diagnostic criteria and clinicopathologic correlation. Am J Surg Pathol 1998; 22(7): 779-94. [http://dx.doi.org/10.1097/00000478-199807000-00001] [PMID: 96693 41] ]. Although GCT is a neoplasm derived from neural crest cells, many pathologists routinely employ immunohistochemical nuclear staining, such as for S-100 and Sox-10, for diagnostic purposes [13Karamchandani JR, Nielsen TO, van de Rijn M, West RB. Sox10 and S100 in the diagnosis of soft-tissue neoplasms. Appl Immunohistochem Mol Morphol 2012; 20(5): 445-50. [http://dx.doi.org/10.1097/PAI.0b013e318244ff4b] [PMID: 224953 77] , 14Rodríguez-Ares T, Varela-Durán J, Sánchez-Salorio M, Varela-Nuñez R, Capeans-Tomé C, Urdiales-Viedma M. Granular cell tumor of the eye (myoblastoma): Ultrastructural and immunohistochemical studies. Eur J Ophthalmol 1993; 3(1): 47-52. [http://dx.doi.org/10.1177/112067219300300109] [PMID: 838 7364] ]. The treatment of choice for orbital GCT is surgical excision. However, following surgery, the risk of diplopia is high due to damage to extraocular muscles [4Ribeiro SF, Chahud F, Cruz AA. Oculomotor disturbances due to granular cell tumor. Ophthal Plast Reconstr Surg 2012; 28(1): e23-7. [http://dx.doi.org/10.1097/IOP.0b013e3182141c54] [PMID: 214647 81] , 5Callejo SA, Kronish JW, Decker SJ, Cohen GR, Rosa RH Jr. Malignant granular cell tumor metastatic to the orbit. Ophthalmology 2000; 107(3): 550-4. [http://dx.doi.org/10.1016/S0161-6420(99)00135-9] [PMID: 107118 94] ]. Here we present a case of orbital GCT with the involvement of the rectus inferior muscle, along with a review of the recent literature. The importance of excisional biopsy and immunohistochemical analysis for correct diagnosis and treatment strategies are also discussed in this article. 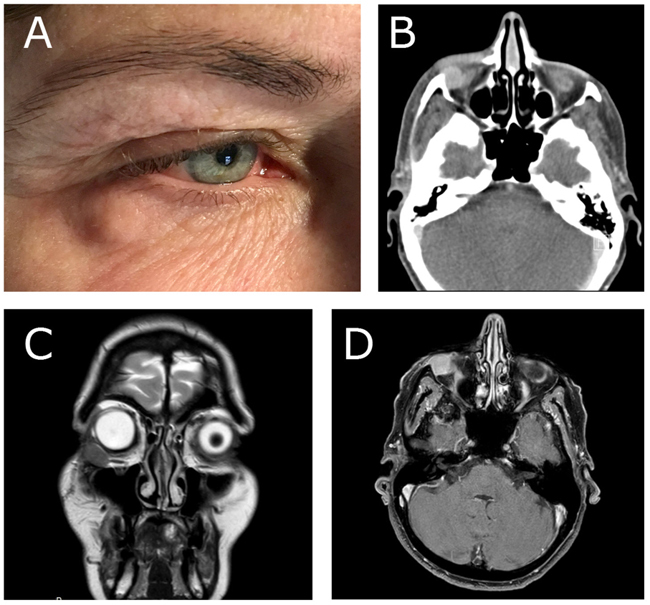 A 55-year-old woman was referred to the Department of Otorhinolaryngology, Head and Neck Surgery, Linköping University Hospital, Sweden, for evaluation of swelling at the lateral border of the right eye (Fig. 1a ). No pain or visual disturbances were experienced by the patient. She had a 2-year history of swelling without any family history of malignancy or chronic disease. By palpation, a cartilaginous-like tumor with good motility and a smooth surface was felt at the conjunctive side of the right lower lid. Further investigation with slit-lamp biomicroscopy showed the presence of a subconjunctival mass adjacent to the right inferior rectus muscle. Force duction test did not reveal any restriction of muscle movement. Complete ophthalmological examination revealed intraocular pressure of 17 mm Hg on the right side and 15 mm Hg on the left side, with normal ocular motility. Visual acuity was 20/20 in both eyes. CT-scan showed a homogeneous soft-tissue mass of 14 × 14 × 8 mm in the right retrobulbar space, with bone erosion (Fig. 1b ). Further MRI examination showed a solitary soft-tissue mass adjacent to the rectus inferior muscle (Figs. 1c & d ). Excisional biopsy was performed, and histological examination identified the lesion as GCT (Fig. 2 ); H&E, magnification × 20). 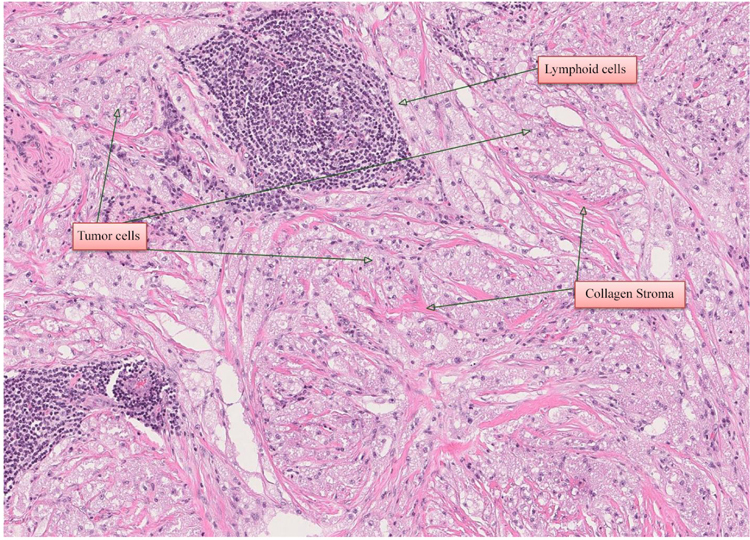 The histological pattern included lymphoid cells, fibrous stroma, and large polygonal eosinophilic cells with abundant granular cytoplasm and round nuclei. There were no signs of malignancy. The tumor was resected through a transconjunctival approach using general anesthesia (Figs. 3a & 3b ). The lower eyelid was everted using two stitches of 5-0 nylon through the tarsal plate. The incision was made using retroseptal approach through mucous membrane tissue in the right inferior fornix of the periorbital soft tissue (3 mm below the tarsus). The excised tumor measured 19 ×16 × 8 mm; it was firm and avascular (Figs. 3a & 3b ). The tumor was infiltrated within the inferior rectus muscle, which made it difficult to excise completely. Thus, we had to remove the tumor with approximately 1 mm of the right lateral border of the inferior rectus muscle. Finally, the conjunctiva was closed with two 4-0 resorbable sutures. Macroscopic appearance of the tumor revealed a gray-tan-colored to brownish mass measuring 19 × 16 × 8 mm (Fig. 3c ). The specimen was fixed in 10% buffered neutral formalin, routinely processed, and embedded in paraffin wax. Sections were stained with Hematoxylin and Eosin (H & E). Final microscopic examination revealed a homogeneous population of large, round tumor cells with small nuclei and abundant eosinophilic granular cytoplasm infiltrating dense fibroconnective tissue (H & E, magnification ×40) (Fig. 3d ). There were no signs of cell atypia, necrosis, or increased mitotic activity at higher magnification (H&E, magnification ×40) (Fig. 3d ). On immunohistochemical staining, the granular cells were immunereactive for the proteins S-100 (Fig. 3e ), SOX10, and calcitonin and also negative for desmin, myogenin, Smooth Muscle Antigen (SMA), Melan-A, and HMB-45. Proliferation activity of tumor cells for Ki67 was 1-2%. A-D. Clinical photograph and radiological imaging of patient with granular cell tumor. A. Clinical photograph with swelling at the lateral border of the right eye. B. preoperative CT-scan. C and D. Preoperative MRI. Postoperatively and until two months after surgery, the patient experienced diplopia in sight direction laterally downwards. The ophthalmological examination showed some reduction in elevation and lateral movement of the right eye. Six months later, MRI radiography revealed postoperative fibrosis with no signs of inferior rectus muscle entrapment (Figs. 4a & 4b ). At 1.5-year follow-up, no diplopia was recorded. Ophthalmological examination revealed intraocular pressure of 15 mm Hg on the right side and 14 mm Hg on the left side, normal ocular motility, and visual acuity. In this case, no recurrence was noted at 1.5-year follow-up, either clinically or radiologically (Figs. 4c & 4d ). Histological image of the excisional biopsy (H & E, magnification ×20). A-E. A. Clinical photograph of surgical resection of tumor by the transconjunctival approach. B. Gross specimen of tumor mass. C. Gross sections of tumor mass. D. Histological photograph of GCT (H & E, magnification ×40). E. Immunohistochemical staining with antibodies that were immune-reactive to S100. A PubMed search was performed up until April 2018 on the terms “Granular Cell Tumor” and “Orbit”. Case reports written in English were included. Cases written in other languages and those with ocular adnexa involvement were excluded. Demographic data on age, gender, symptoms, duration of symptoms, ophthalmological findings and restriction in ocular movement were registered. We also analyzed treatment strategies and recurrence rate. The present paper is authored as a narrative review contribution. A and B. MRI six months postoperatively. C and D. One-year follow-up with MRI. A PubMed search gave 35 articles in total. We excluded five articles (six cases) due to being written in German. Altogether, 30 articles (involving 38 cases, 15 males and 20 females with a mean age of 44.4 years (range 4-75 years) were included in the study. Demographic data are given in Table 1. The different treatment strategies presented in previous studies included total resection, subtotal resection, biopsy and follow-up, and lastly additional treatment with radiotherapy and systemic chemotherapy. Recurrence rates for GCTs according to treatment, age, and site of origin are presented in Table 2. Demographics and clinical features of GCTs. Recurrence rate of GCTs according to treatment, age, and site of origin. We have presented a case of GCT within the right orbit in a 55-year-old woman, along with a review of 38 cases in the recent literature [4Ribeiro SF, Chahud F, Cruz AA. Oculomotor disturbances due to granular cell tumor. Ophthal Plast Reconstr Surg 2012; 28(1): e23-7. [http://dx.doi.org/10.1097/IOP.0b013e3182141c54] [PMID: 214647 81] , 6Salour H, Tavakoli M, Karimi S, Rezaei Kanavi M, Faghihi M. Granular cell tumor of the orbit. J Ophthalmic Vis Res 2013; 8(4): 376-9. [PMID: 24653826] , 14Rodríguez-Ares T, Varela-Durán J, Sánchez-Salorio M, Varela-Nuñez R, Capeans-Tomé C, Urdiales-Viedma M. Granular cell tumor of the eye (myoblastoma): Ultrastructural and immunohistochemical studies. Eur J Ophthalmol 1993; 3(1): 47-52. [http://dx.doi.org/10.1177/112067219300300109] [PMID: 838 7364] -37Hsu SH, Fu KC, Pang SH. Granular cell myoblastoma of the orbit. Chin Med J 1955; 73(5): 436-40. [PMID: 13277044] , 40Poyraz CE, Kiratli H, Söylemezoğlu F. Granular cell tumor of the inferior rectus muscle. Korean J Ophthalmol 2009; 23(1): 43-5. [http://dx.doi.org/10.3341/kjo.2009.23.1.43] [PMID: 193374 79] ]. In the case presented, the tumor was successfully resected with no recurrence or postoperative sequelae during the 18 months of follow-up. Physical examination revealed no other abnormalities or visual disturbances. Slit-lamp biomicroscopy showed a subconjunctival mass adjacent to the right inferior rectus muscle. In this case report, a pre-surgical biopsy was necessary to differentiate between a benign and a malignant lesion. In the literature, other lesions such as lymphoma, lacrimal cyst, meningioma, schwannoma, and glioma might be considered as differential diagnoses to GCT in this area [4Ribeiro SF, Chahud F, Cruz AA. Oculomotor disturbances due to granular cell tumor. Ophthal Plast Reconstr Surg 2012; 28(1): e23-7. [http://dx.doi.org/10.1097/IOP.0b013e3182141c54] [PMID: 214647 81] , 5Callejo SA, Kronish JW, Decker SJ, Cohen GR, Rosa RH Jr. Malignant granular cell tumor metastatic to the orbit. Ophthalmology 2000; 107(3): 550-4. [http://dx.doi.org/10.1016/S0161-6420(99)00135-9] [PMID: 107118 94] ]. In the present study, the patient was referred with a 2-year history of swelling at the lateral border of the right eye without any other symptoms. Previous case reports and case series on GCT of the orbit showed that the most common symptoms were diplopia (55%) and proptosis (21%), the mean duration of symptoms being 15.6 months (range 1-72 months) (Table 1). MRI is superior to CT-scan for evaluation of ocular muscles and soft tissue within the orbit in relation to the tumor mass [18Yuan WH, Lin TC, Lirng JF, Guo WY, Chang FP, Ho DM. Computed tomography and magnetic resonance imaging findings of intraorbital granular cell tumor (Abrikossoff’s tumor): A case report. J Med Case Reports 2016; 10(1): 119. [http://dx.doi.org/10.1186/s13256-016-0896-5] [PMID: 271 76551] ]. The present case showed characteristic features of GCT on MRI: An oval lesion with circumscribed borders which was isointense to gray matter relative to extraocular muscles on T1-weighted images and hypointense on T2-weighted images relative to fat, and showed strong contrast enhancement. CT-scan and MRI reveal information such as tumor size, extent of the tumor, and metastatic spread. These modalities cannot differentiate between GCT and other benign or malignant tumors of the orbit. Histological analysis of a tumor is regarded as the gold standard for distinguishing malignant tumors from benign. In the literature, malignant presentation accounts for approximately. 1-3% of all GCTs [18Yuan WH, Lin TC, Lirng JF, Guo WY, Chang FP, Ho DM. 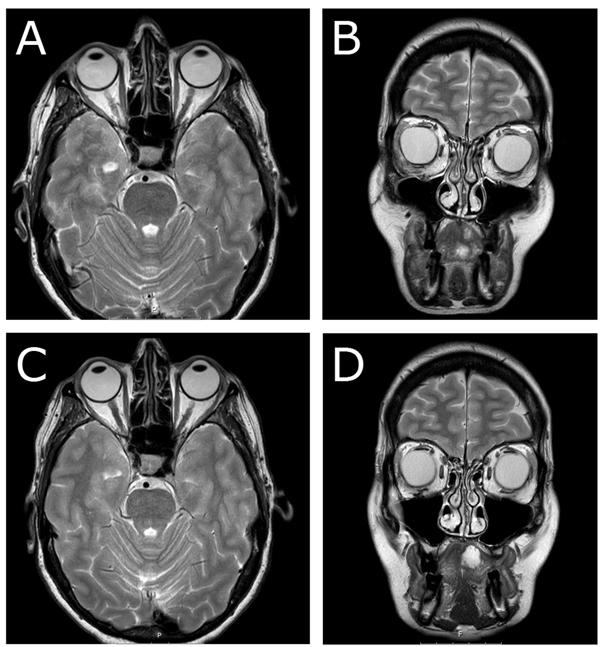 Computed tomography and magnetic resonance imaging findings of intraorbital granular cell tumor (Abrikossoff’s tumor): A case report. J Med Case Reports 2016; 10(1): 119. [http://dx.doi.org/10.1186/s13256-016-0896-5] [PMID: 271 76551] ]. Fanburg-Smith et al., put forward six histological criteria for malignant diagnosis: (1) necrosis, (2) spindling, (3) vesicular nuclei with large nucleoli, (4) increased mitotic activity (> 2 mitoses per 10 high-power fields at 200× magnification), (5) high nuclear to cytoplasmic ratio, and (6) pleomorphism [12Fanburg-Smith JC, Meis-Kindblom JM, Fante R, Kindblom LG. Malignant granular cell tumor of soft tissue: Diagnostic criteria and clinicopathologic correlation. Am J Surg Pathol 1998; 22(7): 779-94. [http://dx.doi.org/10.1097/00000478-199807000-00001] [PMID: 96693 41] ]. The presence of three or more of these criteria confirms the diagnosis of malignant lesion. In the case of pleomorphism only, without any of the other criteria, the tumor is classified as benign. We found a homogeneous population of large round tumor cells with small nuclei and abundant eosinophilic granular cytoplasm, infiltrating dense fibroconnective tissue. There were no signs of cell atypia, cell pleomorphism, necrosis, or increased mitotic activity. This is important to consider during the pre-surgical evaluation and highlights the importance of excisional biopsy in treatment strategies for GCT. In the present literature review, four of 39 GCTs in the orbit were malignant (10.5%), which is a considerably higher frequency of MGCT than previously reported from other sites of the body. The immunohistochemical characteristics of GCTs have been discussed in the literature and their probable origin from Schwann cells has also been considered [8Ghassibi MP, Ulloa-Padilla JP, Dubovy SR. Neural tumors of the orbit: What Is New? Asia Pac J Ophthalmol (Phila) 2017; 6(3): 273-82. [http://dx.doi.org/10.22608/APO.2017157] [PMID: 28558180] , 17Zhang ML, Suarez MJ, Bosley TM, Rodriguez FJ. Clinicopathological features of peripheral nerve sheath tumors involving the eye and ocular adnexa. Hum Pathol 2017; 63: 70-8. [http://dx.doi.org/10.1016/j.humpath.2017.02.006] [PMID: 28 235631] , 38Rejas RA, Campos MS, Cortes AR, Pinto DD, de Sousa SC. The neural histogenetic origin of the oral granular cell tumor: An immunohistochemical evidence. Med Oral Patol Oral Cir Bucal 2011; 16(1): e6-e10. [http://dx.doi.org/10.4317/medoral.16.e6] [PMID: 20526269] ]. These tumors are positive for expression of protein S-100, which supports the neural origin of GCTs [19Morita S, Hiramatsu M, Sugishita M, et al. Pazopanib monotherapy in a patient with a malignant granular cell tumor originating from the right orbit: A case report. Oncol Lett 2015; 10(2): 972-4. [http://dx.doi.org/10.3892/ol.2015.3263] [PMID: 26622607] ]. Furthermore, it has been found that the granular cells are also positive for inhibin-a (a peptide hormone that participates in the regulation of the pituitary gland) and CD68 (a macrophage marker) [39Le BH, Boyer PJ, Lewis JE, Kapadia SB. Granular cell tumor: immunohistochemical assessment of inhibin-alpha, protein gene product 9.5, S100 protein, CD68, and Ki-67 proliferative index with clinical correlation. Arch Pathol Lab Med 2004; 128(7): 771-5. [PMID: 15214825] ]. Expression of CD68 in GCTs is related to the intracytoplasmic accumulation of phagolysosomes. Total surgical removal of the tumor with tumor-free margins is the optimum treatment option. This may be difficult to achieve in cases with extraocular muscle involvement. In the literature, the most affected extraocular muscles are the inferior rectus (26%) and medial rectus (38%) [4Ribeiro SF, Chahud F, Cruz AA. Oculomotor disturbances due to granular cell tumor. Ophthal Plast Reconstr Surg 2012; 28(1): e23-7. [http://dx.doi.org/10.1097/IOP.0b013e3182141c54] [PMID: 214647 81] ]. At the time of diagnosis, almost 80% of patients show diplopia, and after surgical resection, the diplopia persists in 73% of cases [4Ribeiro SF, Chahud F, Cruz AA. Oculomotor disturbances due to granular cell tumor. Ophthal Plast Reconstr Surg 2012; 28(1): e23-7. [http://dx.doi.org/10.1097/IOP.0b013e3182141c54] [PMID: 214647 81] , 40Poyraz CE, Kiratli H, Söylemezoğlu F. Granular cell tumor of the inferior rectus muscle. Korean J Ophthalmol 2009; 23(1): 43-5. [http://dx.doi.org/10.3341/kjo.2009.23.1.43] [PMID: 193374 79] ]. Previous studies have shown a recurrence rate of 16% for all treatment approaches (Table 2). After total surgical resection and subtotal resection, the recurrence rate has been 10% and 37%, respectively [27McNab AA, Daniel SE. Granular cell tumours of the orbit. Aust N Z J Ophthalmol 1991; 19(1): 21-7. [http://dx.doi.org/10.1111/j.1442-9071.1991.tb00317.x] [PMID: 16455 57] ].In the present case, MRI examination showed a solitary soft-tissue mass with involvement of the rectus inferior muscle. The surgical removal of the tumor in our case was challenging, due to the risk of permanent extraocular dysfunction. We removed the tumor with approximately 1 mm of the right lateral border of the inferior rectus muscle. This was necessary to avoid recurrence, and when there is diplopia various strabismus procedures would have to be used for primary ocular alignment. MGCTs are rare, and only a few cases have been reported in the literature. Fanburg-Smith et al. presented 28 cases of MGCT and found local recurrences in 32% and metastases in 50% of the cases [12Fanburg-Smith JC, Meis-Kindblom JM, Fante R, Kindblom LG. Malignant granular cell tumor of soft tissue: Diagnostic criteria and clinicopathologic correlation. Am J Surg Pathol 1998; 22(7): 779-94. [http://dx.doi.org/10.1097/00000478-199807000-00001] [PMID: 96693 41] ]. Eleven of the 28 patients with MGCT (39%) died of the disease after a median time interval of 3 years. Again, these findings highlight the importance of excisional biopsy for correct diagnosis and treatment strategies. In malignant cases, monotherapy with pazopanib (a tyrosine kinase inhibitor) in combination with radiotherapy and wide surgical excision of the tumor would be the treatment of choice [19Morita S, Hiramatsu M, Sugishita M, et al. Pazopanib monotherapy in a patient with a malignant granular cell tumor originating from the right orbit: A case report. Oncol Lett 2015; 10(2): 972-4. [http://dx.doi.org/10.3892/ol.2015.3263] [PMID: 26622607] ]. However, more studies are needed to confirm these findings. The occurrence of GCT within the orbit is a rare event and a PubMed search gave a total of 39 cases. GCT should be considered in the differential diagnosis of orbital tumors and a biopsy will often be required to exclude malignancy. The choice of treatment for GCTs is complete surgical resection, and the recurrence rate is low. Written informed consent was obtained from the patient for her anonymized information to be published in this article. Abrikosov AA. Über Myome ausgehend von der quergestreiften willkürlichen Muskulatur. Virchows Arch 1926; 260: 215-33. Masamatti SS, Gosavi AV. Histopathological study of malignant oral tumous: A five-year study. Int J Sci Stud 2016; 4: 30-4.